I didn’t think I was going to get much out of this book. I had already read The 5 Love Languages for couples, and how much more can you really say about this topic? I enjoyed the couple version of the book because it was filled with stories and examples and helped me understand myself, my husband, and the people around me in a different way. It helped me love better. So I was set, right? Still, I figured it wouldn’t hurt to give this book a shot, since it was so highly rated on Amazon. Five chapters in, I was still feeling this way. I got this. Nothing mind-blowing. I mean, it’s helpful to see how to show love to children in particular by using the five love languages of words of affirmation, acts of service, physical touch, gifts, and quality time. However, I still felt that it was not a book I’d recommend to someone like me who had already read the couple’s version of the book. “Hey so I read something kinda interesting today in the Five Love Languages book. He says that children will respond better to discipline if their love tanks are full. So if you have to give them a consequence, you should sandwich it with love. Like if their love language is physical touch, give them a hug and some affirming words or something and then gently give the consequence and then hug again and give affirming words to close. We’d talk, we’d reconsider old understandings and start to form new ones. It was pretty neat. This happened a few times, and before I knew it, I was furiously jotting down notes in my journal because I knew I’d be referring back to it. I even regretted borrowing the book from the library instead of buying my own copy, since my habit with useful books is to scrawl all over them for better retention and for future reference. As I was finishing the book, I started an email to the parent group at my church to share with them some of my key learnings. I figured they would be interested in hearing some practical ideas on how to love their children better, and it would also help me to have notes in my email to refer back to. So I typed them up, and was about to send them out, and then figured HEY wouldn’t my blog readers be interested in this, too? Because if you have children of your own or work with kids, chances are you want them to know they are loved. So here you go! Some of the main things I want to remember and apply and grow in as I learn to be a more loving parent to my children. May you find it beneficial! 1. Your child’s love language may change over time, so don’t peg one when you observe it and think it sticks forever. This is especially true the first few years of life, so be generous in showing love in all five languages for those early years. 2. Once you do know what your child’s MAIN love language is, continue to show it in all five ways, but know that you should definitely always show love to them in their main love language. You’ll hit the deepest needs of their love tanks that way. But also continue to show in the other 4 ways! 3. Children respond much better to discipline when their love tanks are full. This is not to say that we should be permissive, but just that they should always feel secure in your love. When children feel loved, they identify with you and your goals better, and when your goal is to help them grow in godliness, they will accept your discipline better. If they don’t feel loved (even if they know in their heads that they are probably loved), then they are much more likely to feel resentful at you and your discipline and rebel instead. 4. Sandwich discipline with love. Never discipline out of anger anyway, but when you do discipline your child, preface and end it with love. You want to demonstrate God’s unconditional love to your child. Your child should know that you are disciplining them out of love. For example, if your child’s love language is touch, then start off with a hug and let him know that it hurts you too to see him suffer, but that he needs consequences for his poor decisions. Let him know that you love him and that you’re disciplining him out of love. Then give him his consequence, and then follow it up with another hug and let him know that you love him and want the best for him. 5. Be careful not to punish your child by withholding their love language. For example, if your child’s love language is quality time, try not to punish her by making her go to her room in isolation. Not only will she feel punished, but she will feel unloved, and that is definitely not the goal as we are to love our children unconditionally. Another example: while you should never use cutting words, be especially careful about this with a child whose love language is words of affirmation. The words will hurt, but also stick and cut more deeply and make her feel unloved. 6. A child who feels loved will thrive at school. Sending off and receiving your child from school are actually two very important moments in your day, so try to be very intentional with those two times in particular. A child that is sent off to school feeling very secure in your love is more emotionally stable and can focus better and do better in school. If their love language is physical touch, give them a hug and a kiss before sending them off. If it’s acts of service, help them pack up their backpack and get ready in the morning. When they come home, greet them with a hug (physical touch), or prepare a snack for them (acts of service), or have a little treat (gifts), or give them your undivided attention as they share about their day at school (quality time), etc. It can be easy to be rush-rush-rush in the morning, just getting yourself ready for the day and expecting your child to get herself ready and then just sending them off, but a little intentionality can go a long way in making their day so much brighter and helping them feel more grounded and secure. You’re also probably very tired coming home from work in the evenings, but if you come home with the intentional attitude of touching base in a loving way with your child first, it will mean a lot to them. There is a pretty significant section in the book that emphasizes having loving interactions specifically at the points when you send your child off to school and when your child comes home from school (or, if you’re not home at that time, then when you first see them after work), so I felt this was worth noting. 7. Train your child to handle their anger well. To be honest, I can’t remember how this relates to the love languages at the moment, but this was a really interesting chapter. First, the authors posit that the worst way to express anger is through passive-aggressive behavior, which they define as “an expression of anger that gets back at a person or group indirectly, or ‘passively.’ It is a subconscious determination to do exactly opposite of what an authority figure wants” (164). 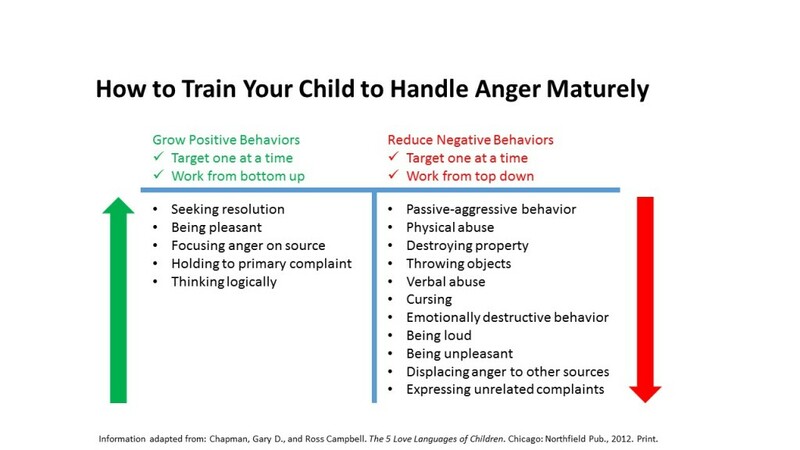 The goal then, is to train your child to grow more mature in handling anger. To implement their method, you first have to choose to allow your child to express his anger VERBALLY, rather than behaviorally, and rather than shutting them down when they say something you don’t like. “When your child vents anger in words, you are able to train her in the direction of mature anger management” (167). Your angry child’s very own words are the raw materials you use for training. So let them have at it. It may feel disrespectful, but if you don’t let a child vent anger verbally, what other options do they have? They can either bottle it up, or act out behaviorally or passive-aggressively. It’s harder to train a child to handle anger maturely when their anger is vented in these other ways, but when they verbally express it, then there are ways you can help them grow. Watch your child handle their anger verbally, and then identify which positive and negative behaviors they are displaying. Select either one positive behavior to coach them toward, or one negative behavior to coach out of them, always targeting only one behavior at a time. The length of time it takes for your child to master the new behavior (either gaining a positive or losing a negative) may vary greatly. Persist. Let her know that you are not going to condemn her. Otherwise she may feel so guilty that she resolves to never express her anger verbally again and keep her feelings bottled up. Commend her for the things she did right: “You did let me know that you were angry, and that is good. You didn’t let your anger out on your little brother or the dog. You didn’t throw anything or hit the wall. You simply told me that you were angry” (172). Help her make an improvement with a request (not a demand) for the next desired behavior (or which behavior to drop, from the negative behavior side). When I explained all this to Ben, he laughed and said he felt that he needed to mature in handling anger, too. And he’s just about the last person I’d ever think of as having an anger problem, so I guess unless you’re at the most mature stage already (i.e. when angry, you are “pleasant, seeking resolution, focusing anger on source, holding to primary complaint, and thinking logically”) this could be a self-improvement goal for anybody! After all, our children often learn the most by watching our examples, so the best training could be modeling mature anger management yourself. There were certainly other great points made throughout the book, but these were my main takeaways. Since reading it, I have found myself hugging, kissing, caressing, and spending so much more focused time with my daughter. She’s eating it up, and even though it takes so much more time and energy to spend this focused time with her, I am already seeing the benefits. She’s a lot less clingy when I leave her with others, and maybe, just maybe it’s because her love tank is full and she feels secure in my love before I leave. I hope this post encourages you to either read the book for yourself, or be more intentional about how you understand and love your child. As always, may you find it beneficial, and may it help you grow in your ability to love better! Chapman, Gary D., and Ross Campbell. The 5 Love Languages of Children. Chicago: Northfield Pub., 2012. Print. My now 17-month-old daughter has just figured out how to make noisy kisses (versus the open-mouthed momentary contact), and also figured out we love it and keep asking for it. Awww it’s so cute when they really start being kissy kissy :DDD I love that she knows somehow to ask for the love or show she needs some reassurance of the love :))) Sounds so beautiful!! So, the following weekend I cancelled everything and we just lay low the entire two days, just the two of us. It worked wonders! No more acting out! And then this past summer, when he was having difficulty with being apart for day-camp, I did the same; poured on the love and affection and attention, to ease things for him…. It really does work! Now, to try it in a discipline context….! Yes! I commented on another post before but I also got an error message! Ah! Well, looks like things are up and working again. Whew. I feel better knowing that now. So nice to have feedback again :). Thanks, Nancy! I really enjoyed your write up of this and especially the “how to handle anger maturely” piece of it. Forget the child application, *I* can use these tips! Right? I am definitely not at the “most mature level” for handling anger, either. Sigh. Always something to work on! 🙂 Thanks for the comment! Thanks for commenting, Nancy! I’m so glad you found some good takeaways! Also, it’s a relief to hear from someone– I feel like comments have been kinda quiet lately, so this is encouraging =). (One friend mentioned that every time she’s tried to comment lately, she gets a “timed out” message so I wonder if other people have experienced that? Hopefully my updates have fixed the problem! ).